← The Obama-Francis Ticket to Hell & Why You Should Own a Gun & Pray the Rosary! “I am concerned about the confidences of the Virgin to the little Lucia of Fatima. The persistence of the Good Lady in face of the danger that threatens the Church is a divine warning against the suicide that the modification of the Faith, liturgy, theology, and soul of the Church would represent. Healthcare Reform…Cui Bono? Financial Reform…Cui Bono? Climate Change…Cui Bono? Common Core…Cui Bono? NSA Surveillance…Cui Bono? Gun Control…Cui Bono? The Immoral Marxist Psychopath in the White House…Cui Bono? The Jesuit Pope in the Vatican…Cui Bono, Cui Bono, Cui Bono? Meaning To Whose Benefit?, this Latin expression is common in criminal investigations where motive is tied to financial gain in order to identify those suspected of committing the crime. I can categorize every single social issue above as a crime scene because in every single instance something of great value has been stolen. In EVERY single instance above, you and I are the victims because in every single instance above our greatest treasure, Individual Liberty, has been or is being stolen from us…begging the question Cui Bono??? How did you and I (The Individual Investors) make out in the financial collapse in 2008? How about during the Euro Crisis, the collapse of MF Global, Greece and Cyprus? 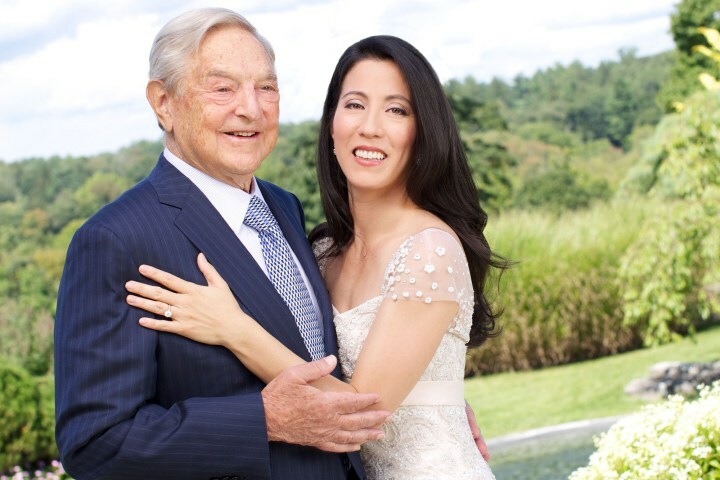 Because the man Glenn Beck exposed as “Spooky Dude” pictured above with his nuptial grand daughter, has been smiling all the way to the bank…the World Bank that is! Yes, it seems that the man who survived Hitler by confiscating the individual properties of his fellow Jews, has turned profiting on human misery into a political art form! It would seem that Mr. “Broke the Bank of England” Soros has more than gotten by With a Little Help from his Friends! What a lovely affair that must have been! I wonder if former World Bank Senior Counsel Karen Hudes was invited. Judging by what she’s had to say, my guess would be NO! I found her comment at 8:58 of particular interest given the Papal-inspired Fundamental Transformation underway in the Vatican. “And a lot of this corruption is coming from the Federal Reserve. But I would have to say that the lion’s share is coming from the Vatican…from the Jesuits.” By the way, did you know that the Gay Marriage, Euthanasia and Abortion (I guess that would be youth-anasia)- supporting Atheist Spooky Dude has given hundreds of thousands of dollars to…his Catholic friends? CUI BONO MONSIGNOR??? Yes, the Catholics in Alliance for the Common Good they call themselves. Do you know what the “Common Good” means in Latin? It means “You And I Are Screwed!” pal! 😦 Now would be a VERY good time to WAKE UP, SPEAK OUT and QUESTION WITH BOLDNESS!!! Wedding gift? What do you give the man who already has EVERYTHING? This entry was posted in Economy, Entertainment, Politics, Religion, Society, Uncategorized and tagged federal reserve, gold, hudes, jesuits, new world order, obamacare, pope frances, soros, vatican, world bank. Bookmark the permalink.